To ensure quality holistic palliative care and support for patients at Leratong. To promote holistic palliative care through mentorship, training and engagement with the community and relevant stakeholders. To maintain Leratong accreditation by Council of Health Services Accreditation of Southern Africa. To ensure sustainability of Leratong through excellence in governance, leadership and management and service. 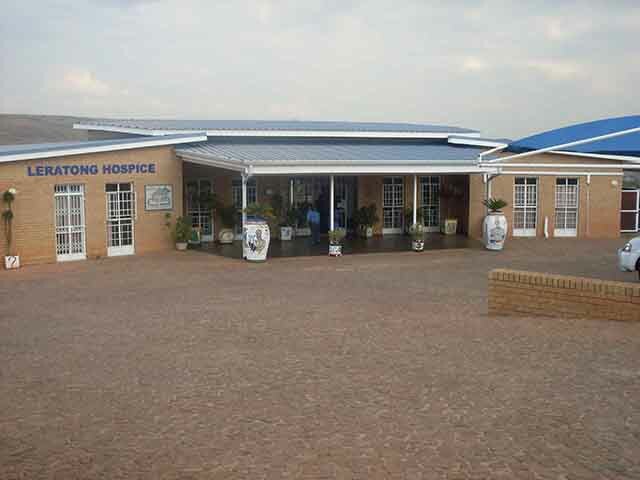 Leratong hospice founded by Fr. Kieran Creagh CP, born in North Belfast, Ireland, ordained a priest of the Passionist congregation in Mount Argust, Dublin in 1993.He arrived in SA in 1998, to replace a priest in St. George’s Parish in Atteridgeville. His stay was meant to be only for six months but it lasted for nearly a decade. The inspiration of building the hospice came after the young Belfast priest had been called many times to administer the Last Rites to people dying in abject poverty especially from HIV/AIDS. When moved by this plight, he used to call a retired Nursing Tutor, Remigia Tloubatla, one of his parishioners. She was easily available in her home or in the parish premises as she was involved in a community project initiated by Fr. John Craven and also sponsored by Fr. Kieran on his arrival with eight sewing machines to teach unemployed women to do basic sewing. Her years of nursing experience were mostly in the curative aspects of theatre in Kalafong Hospital and later as a nursing tutor. It was an unexpected experience for her to be confronted with the scourge of this type of disease, where patients were dying also in abject poverty. With her experience of being trained her nursing skills in a Catholic hospital,, she was able to rise to the occasion by following this young, energetic priest in areas of the township she never ventured before. The priest’s duties were praying for and anointing the sick, drive to and from the local General Practitioner Dr. S. Malatji to collect dressings, ointments, medication and often blankets, mattresses from the parish house. The nurse’s duties were to bathe, dress the ulcerating sores and carry out any basic nursing care to make the patients comfortable. Driving through the informal settlement and township, and using an old Uno vehicle as an ambulance. Often times, the nurse would be left in the township to foot it back home as the car was not big enough to accommodate her and the patient. An Architect volunteered to draw a plan for a hospice, his mother who had requested money instead of her presents for her birthday gave him R1000.00. Having these, the two, accompanied by Dr. Malatji approached Anglo-American to sell the idea. Then the Irish Embassy donated R1 million and big funders followed including Irish Aid, Anglo American, National Lottery Distribution Trust Fund and the Passionist Congregation. 30th June 2003 Pretoria Archbishop George Daniel consecrated the piece of land where the hospice will be built. The construction of the hospice was completed at the end of June 2004 at a cost of R4, 7 million. The hospice which Creagh has built is called Leratong which means a “Place of Love.” It sits on a hill overlooking the township where dusty streets lead to rows of houses, mixed with shacks and trees scattered in between the dwellings. It shines over Atteridgeville as a symbol of HOPE. Board members were identified to manage the building of the hospice, plan for the way forward like managing the finances of the way hospice in equipping the essential equipments, human resources etc. There were done in the line with meeting, the standards set by Hospice Palliative Care Association, therefore the following were set in place. Six retired nurses were recruited from the community and send on a short six month course of Palliative Care accredited to the South African Nursing Council in East Rand Hospice. The course was completed in February 2004 in time for the opening of the hospice. Other staff members also came forward to be interviewed to work as volunteers as community health care workers, housekeeping and maintenance of the building and grounds. The six nurses qualified in Palliative Care Training and one doctor, who is also a member of the board were sent for two weeks in Dublin on an exchange programme between Our Lady’s hospice in Dublin and Leratong Hospice in Atteridgeville. The South African nurses were involved in a palliative refresher course in Harold’s Cross and Blackrock hospices. They also attended lectures in the Royal College of Surgeons for three days in Dublin. Affiliated to the Hospice Palliative Care Association mentored until they were accredited as a five star hospice in 2008 for two years, then again maintained the five star accreditation in 2011 until 2014. His face is gentle, his blue eyes kind and the soft lilting voice brings so much comfort to the desperately ill. Seconded to St. George’s Catholic Church in Saulsville, he spend his time helping the ill including HIV/AIDS victims, trying to ensure that they get medical care, even taking them to hospital in his Uno, eventually conducting their funeral services. In November 2003, he led six volunteers for the Aids Vaccine trial run by the South African Aids Vaccine Initiative. The Aids vaccine, ALPHA VAX, based exclusively on the C-strain of HIV which occurs mainly in Southern Africa. Won international acclaim when he agreed to become the first person in Africa to be injected with a vaccine intended to prevent people from contracting HIV. Although free from the virus, he volunteered to be injected with the drug, which had been tested on animals. The trial was to determine whether the vaccine was safe for use in the human body and to test whether sufficient antibodies would be produced to combat the disease. In October 2004, he was awarded the Irish International Person of the year for his achievement in Fundraising for the establishment of the hospice and his work in the township and also for being the first person to be injected with an HIV vaccine. Winner in community builder of the Year competition as the first man to receive short of a new HIV vaccine tested in South Africa. Also involved in the establishment of Leratong Hospice and Kwa- Siyalala Counselling Centre in Atteridgeville/Saulsville. 28th October 2004 Official opening of the Hospice is done by Pretoria Diocese Archbishop George Daniel. Thursday March 2006 Tanaiste Ms Harney Deputy Prime Minister, during ST. Patrick’s week visited the hospice funded by the Irish Government and remarked on the dignified quality of care given the terminally ill.
28th November 2008 The S.A Local Government Association (SALGA), Department of Provincial and local Government Rep of S.A, Department of Water and Forestry Rep of S.A, Irish Aid, Embassy of Netherlands, Embassy of Sweden Pretoria, Canadian International Development Agency (Cida) and Leratong Hospice joined together to mark the 20th Anniversary of World Aids Day at Leratong Hospice. Ambassador of Ireland, H.E Mr. Colin Wrafter represented Irish Aid. 28th February 2010 Mass of Dedication and consecration of Maria Ma Tshepo Catholic Church. Tree planting- Anglo American Representation and Irish Embassy representation. On the night of 28th February 2007, eight thugs attacked Fr. Kieran shot him three times, left him bleeding and fleeing only with his cell phone, an empty new safe and DVD Player. Taken to little company of Mary, then referred by thoracic surgeon Dr. Phegasam Chetty to Zuid Afrikaans hospital where a bullet lodged in his lungs was removed. Opening of Gym Creagh Training centre. Donation of gym equipment from Virgin Active. On the night of 28th February 2007, eight thugs attacked Fr. Kieran shot him three times, left him bleeding and fleeing only with his cell phone, an empty new safe and DVD Player. Taken to little company of Mary, then referred by thoracic surgeon Dr. Pregasam Chetty to Zuid Afrikaans hospital where a bullet lodged in his lungs was removed. Executive mayor of Tshwane Dr. Gwen Ramokgopa addressed priest Kieran’s father Jim and Brother, together with the BBC journalists, expressing her shock and outrage about the attack. 7th December 2007 executive Mayor’s surprise visit to Leratong hospice to see Fr. Creagh after his return from Ireland where he recovered from his attack. She wanted to check on Fr. Kieran Creagh’s recovery and also thank the staff on their hard work, remarking that her uncle passed in the hospice he received support and quality care. Wednesday July 23, 2008 Two men convicted of the attempted murder of South African based Irish Priest from Leratong hospice in the Atteridgeville Magistrate court and received 25 years sentence each. Taoiseach (Irish Prime Minister) Bertie Ahem visited the hospice to welcome Fr. Kieran Creagh back to Leratong and congratulates him on his recovery, after eight months in Ireland. He returned to South Africa in November 2007. The Taoiseach (pronounced “tea shock”) donated R100 000.00 for use to buy a generator.